Not that long ago, you will recall, David Walliams swam the length of the Thames to raise money for charity – and promptly became rather ill from swallowing river water that had been polluted by sewage. And I’ve written several times in this column about the problems caused by the regular dumping of untreated sewage into the river because the Victorian sewerage system in the capital, which was built when the population of Greater London was fewer than three million, simply cannot cope with the waste from the current eight million inhabitants. So I’m delighted to throw my weight behind a new initiative – called simply Thames Tunnel Now (TTN) – which has launched a campaign in support of the plan to build a so-called ‘super sewer’ under the capital to stop sewage overflowing into the Thames every time it rains hard – an average of 39 million tonnes every year. The campaign is backed by a coalition of 15 environmental charities and amenity groups including the RSPB, the WWF, Thames21, the Angling Trust, the River Thames Society, the Inland Waterways Association, the Marine Conservation Society and the RYA among others. The objective is to persuade Government and local councils to stop stalling and support the project so that what is sometimes referred to as ‘London’s dirty little secret’ becomes a thing of the past. The proposed Thames Tunnel will start in west London at Hammersmith and will generally follow the route of the Thames to Limehouse, where it then continues northeast to Abbey Mills Pumping Station near Stratford. There it will be connected to the Lee Tunnel, which will transfer the sewage to Beckton Sewage Treatment Works. The plans have been put together by Thames Water and the Environment Agency and construction of the tunnel will create 4,000 direct jobs. True, this mammoth project will cost £3.6billion, which will be paid for by Thames Water customers, and will probably create a good deal of chaos while the construction takes place. But if we want the Thames to be a river that is safe for our children to play in, on and beside, and to continue to be an attraction for tourists who bring much-needed money to the economies of so many riverside towns and villages, then it’s a price we have to be prepared to pay. THANKS to Weybridge artist Doug Myers who has been busy with his paintbrushes again down at Walton Bridge as the works progress. 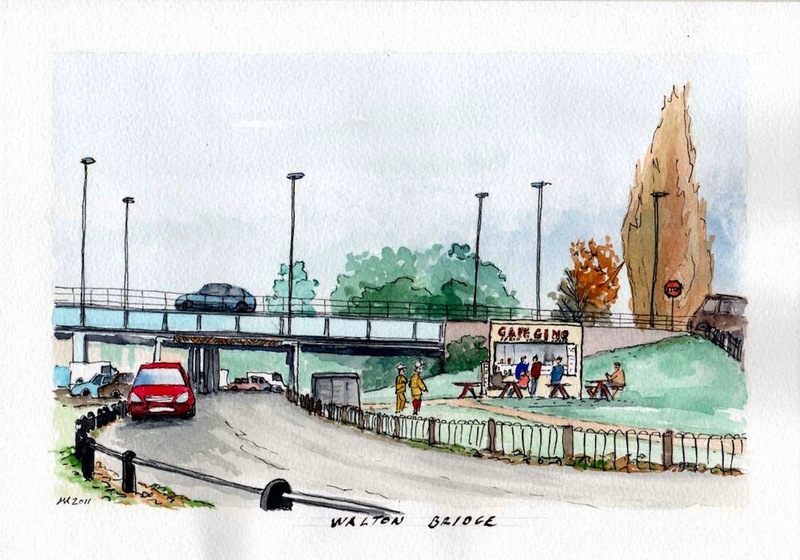 As promised, I’ve included another of his watercolours cataloguing the work going on to build the new crossing. This week, he’s portrayed Café Gino, which is having to move from the site it has occupied for so many years to accommodate the supports for the new bridge. The café has been a regular haunt for many a riverside promenader not to mention dozens of motorcycle couriers and cabbies who call in for a reviving cuppa. Nice one, Doug.